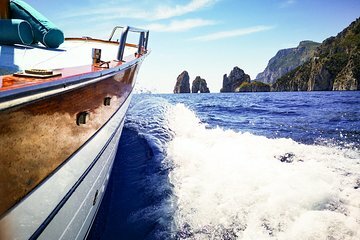 Segeln Sie mit Ihrem Schatz zu einer unvergesslichen Reise rund um die Insel Capri auf dieser privaten Bootsfahrt. Machen Sie zusammen bleibende Erinnerungen, während Sie zu spektakulären Meereshöhlen und Grotten fahren, darunter die berühmte Blaue Grotte und weniger bekannte Orte, die voller Geheimnisse und Romantik sind. Lernen Sie von einem erfahrenen lokalen Segler die Lektionen und die Geschichte der Insel und baden Sie mit klarem, blauem Wasser mit der bereitgestellten Ausrüstung beim Schwimmen und Schnorcheln. Feiern Sie Ihre Reise und Ihre Liebe mit einem 'Caprese'-Mittagessen und einer Flasche Wein an Bord. Expensive but worth the coin. The captain knows the best spots and will move you away from the crowds or park next to the mega yachts if you want to gawk at the rich. The best way to discover Capri ! My wife and i booked the 1pm time. Pick up location was very hard to find. They had no record of us and said we couldn't leave until 2pm Once on board, we were never offered the caprese lunch with a bottle of wine. We were not even offered water. The sailor played his music so loud that we couldn't hear him talk. We also had to pay extra for the blue grotto which we thought was included in the 364 price. Although the sights were amazing, we didn't get what we paid for. Andrea was a great guide, telling us important information on the island and its history. Unfortunately we were not able to go to the Grotta Azzurra, but Andrea made up the day with exclusive close ups to the other grottos and an quiet and beautiful area to swim. His professionalism and cordial personality made for an unforgettable private day. Great job Andrea !!!! We had such a lovely experience on this tour, we highly recommend it! My husband and I were on our honeymoon and wanted to see the gorgeous grotto's and scenery of Capri by water but in a more intimate setting, rather than a group tour, and this was that perfect solution. Mr. Costanza planned a wonderful trip for us. We really appreciated them being flexible on the departure time, as they worked with our schedule so we didn't have to feel stressed and rushed to get to our meeting location. Communication was seamless and easy. We were greeted at a cafe right next to the marina grande harbor and walked over to our boat so there wasn't any confusion on where we should meet. Our boat guide was very kind, spoke English very well and showed us all the beautiful sites, he even offered to take multiple photos of us without us even having to ask. They packed an absolutely delicious picnic lunch for us consisting of fresh sandwiches and white wine, that we thoroughly enjoyed as we sailed under the gorgeous Faraglioni arch. The boat was lovely and very well maintained. I cannot say enough great things about this tour, and if we make it back to Capri in the future, we will definitely go again! Thanks Mr. Costanza for the wonderful memories!